Well, it was my first time back on the road since September and I was in for several post-Christmas surprises. I always try to schedule a review or two around the Christmas season because I enjoy seeing how the inns decorate for the holidays. However, since I operate out of the Midwest, I’ve always got to keep an eye on the weather because I never quite know what’s going to happen. Nebraska had actually been enjoying a rather tepid December and I was rather looking forward to a pleasant drive through Iowa and that’s exactly what I got on Sunday. It was a little cold, but the sky was clear and the drive was smooth. Monday may be a different story, however. A winter storm is set to pummel Nebraska and do a number on Iowa. Fortunately, my good luck seems to be with me as the storm is set to strike Nebraska first and move its way slowly to Iowa. As I’m already in Des Moines, I’m actually a few hours ahead of the storm and it will have just started by the time I hit the road so I should manage to stay just ahead of it. I’ll just be playing things by ear and possibly moving quite slowly. But I’m getting a bit ahead of myself here. A brief two hour drive brought me to Des Moines, IA and Butler House on Grand owned and operated by Clark Smith and Lauren Kernen Smith. Butler House on Grand is a 6100 square foot Tudor mansion nestled close to the downtown area and the artistic center of the city as the Des Moines Playhouse and Arts Center are a hop, skip, and jump away. I was greeted by Clark who led me to the Dynasty Suite which would serve as my home away from home for at least one night. The Dynasty Suite is probably one of the biggest rooms I’ve enjoyed since I started this project. The suite is quite roomy and is highlighted by an en suite Jacuzzi and writing desk. The mansion, itself, has a very pleasant feel to it and I was quite impressed with the Christmas decorations, especially in the living room which featured a real Christmas tree, Christmas village, and various Christmas knickknacks. I took it easy in my room for a few hours as I kept my eye on the weather reports. After a few hours, I decided it was time for dinner and decided to enjoy a nice meal at Taki Japanese Steakhouse. I’m quite partial to teppanyaki cooking, but I can’t say that I would recommend Taki. The restaurant seemed a mite understaffed as I had to wait nearly an hour for a table. Mind you, I don’t put all of the blame for the wait on the restaurant. I did not have a reservation so I did expect to wait, but the teppanyaki room was not very full which suggests a lack of wait staff and/or chefs for the evening. I did get a free Guinness for my long wait and I was able to pass the time with another adventure of Nero Wolfe, the armchair detective whose genius is matched only by his laziness. I ended up sharing a tale with a group of high school girls and it was rather amusing to hear their views on college as at least one seemed to think that partying was going to take priority over studying. Ah, youth. The meal was simply OK and definitely not worth the long wait. It took quite a while for our drinks, soup, and salads to arrive. As a gesture of goodwill, I was not charged for my soda. The clear soup wasn’t very hot and needed a bit more salt. The salad was quite good with the ginger vinaigrette dressing being right on the money. My steak, chicken, and shrimp were cooked well, but needed more seasoning. When all is said and done, I give Taki a thumbs slightly down. After dinner, I returned to the inn where I grabbed a can of soda from the fridge as I looked forward to a long soak and shave. When I entered my room, I was pleasantly surprised that my bed had been turned down with a caramel waiting on my pillows. After a relaxing bath, I tuned in to the weather reports to find that the winter storm warning now engulfed the entire state of Iowa as opposed to just the south & central portions. As I said earlier, snow was not due to hit the Des Moines area until 6am which meant it will have barely started before I hit the road to my next stop. Luckily it will be moving slowly northward which means I should keep on its outskirts for most, if not all, of the drive. The queen bed was quite comfortable with a thick blanket that was so cozy that I didn’t want to get out of bed in the morning. I finally forced myself to just so I could see what the weather was doing. I breathed a sigh of relief as I saw it wasn’t too terrible. A fine, powdery snow was falling and the weather report now said the Des Moines area was only expected to get 6 to 8 inches with little to no ice accumulation and it was the northwestern and southeastern parts of Iowa that were expected to be hazardous. Now knowing my drive would be safer, if slower, I went downstairs for a bracing breakfast. There’s nothing quite like a hot meal on a cold day to start your day off right and Clark and Lauren provided a terrific breakfast. The meal started with hot ginger snap pears served with goblets of water, milk, and orange juice. The main course consisted of a cinnamon roll, fried rosemary potatoes, cheese soufflé with salsa, and sausage patties. I engaged in some conversation with Clark, Lauren, and another couple before returning to my room to polish up this article and begin my snowy trek. 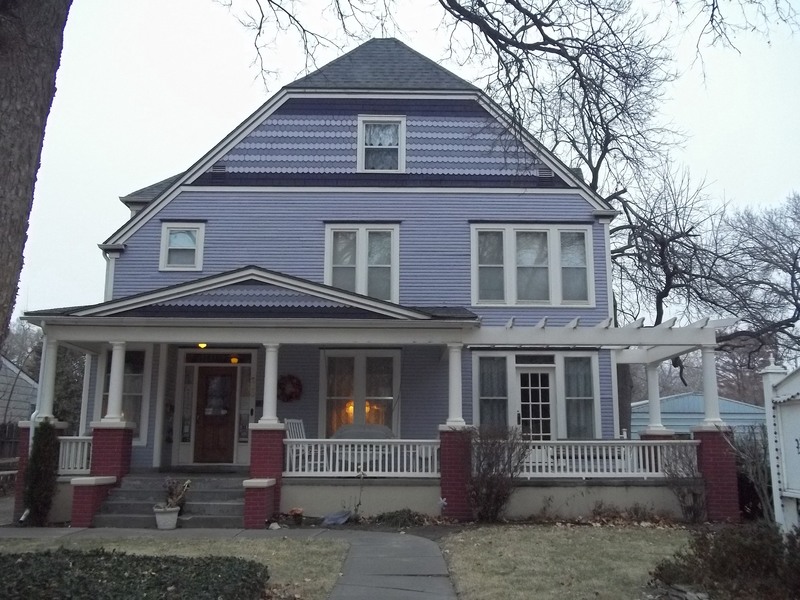 Butler House on Grand is a fine little oasis in the city of Des Moines and the hospitality and cooking of Clark and Lauren will make your stay grand, indeed.